Walter Haskell Hinton first worked for the farm equipment manufacturer John Deere. in 1926, when he was still an employee at the advertising agency Barnes & Crosby in Chicago. His prior work making cover art for farming magazines no doubt qualified him in Deere's eyes: in a 1976 interview Hinton said they wanted him because he knew so much about farming (in fact, Hinton lived most of his life in Chicago). When he began freelancing, he produced a lavish calendar for Deere in about 1937. Printed on fine paper and handlettered, the calendar won acclaim in the advertising trade journal Printing Ink. The success of this project soon brought him other clients. Later, Hinton helped update Deere's leaping buck graphic identity. 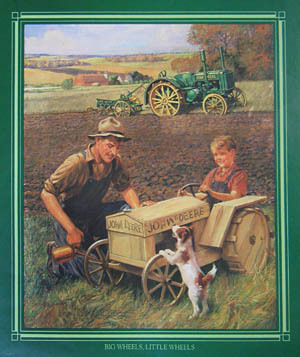 In another series, Hinton illustrated the life of John Deere himsel f- the blacksmith who developed and produced the steel plows that quickly transformed America's plains into farmland. 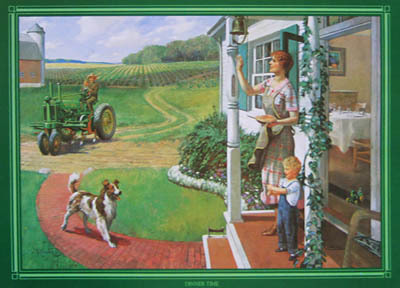 John Deere continues to market memorabilia incorporating advertising images that Hinton originally created as long as 80 years ago. 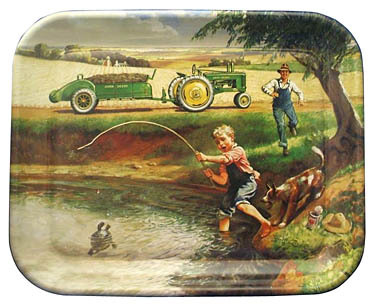 Turtle Trouble, originally painted in the 1930s, reproduced on a tray. Dinner Time, from 1984 reissue of 1930s calendar images. Note the characteristic "Hinton dog", which appears in many of his paintings. 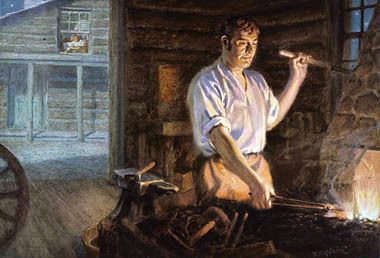 John Deere's start as a blacksmith. 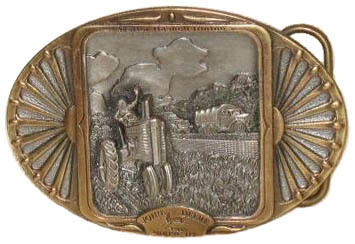 Belt buckle, with image of woman driving tractor while soldiers drive by. Image dates from the 1940s, the buckle much later. All images are copyright © Deere and Company.